A London exhibition celebrating the life and work of one-time Bermuda resident David Bowie has become the Victoria & Albert Museum’s fastest-selling event ever. The museum says 50,000 advance tickets have been sold for its “David Bowie Is” show. More than 600 objects spanning Mr. Bowie’s 50 years in show business have been brought together for the first time, including hand-written lyrics, costumes, photographs, film, music videos, set designs and album artwork. The museum in South Kensington, London, has been given unprecedented access to the David Bowie Archive for the exhibition — the first international retrospective to focus on his extraordinarily varied career. The show opens on Saturday [Mar. 23] and runs until August 11. Iconic singer/songwriter, music producer, visual artist and occasional actor Mr. Bowie and super model wife Iman [pictured together above] lived at a waterfront Sandys Parish home for close to a decade beginning in the late 1990s. The superstar couple maintained a low-profile on the island during the time Bermuda was their primary residence. But they made occasional public appearances. Mr. Bowie attended the awards presentation at the second annual Bermuda International Film Festival in 1998. And one year he and Iman were in the audience at a Bermuda High School for Girls Christmas concert which the daughter of a local employee was performing in. Mr. Bowie completed most of the songs on 1999′s “Hours…” — his 21st studio album — in Bermuda. He also recorded a cover version of John Lennon’s ”Mother” here with a group of musicians that included Bermudian drummer Andy Newmark. A close friend of the slain ex-Beatle — who spent the last summer of his life in Bermuda in 1980 — Mr. Bowie co-wrote his first number one US hit single “Fame” with John Lennon in 1975. Intended for a tribute album which was never released, the Bermuda recording of “Mother” subsequently surfaced on the Internet. Drummer Mr. Newmark had actually been part of the session band which worked on John Lennon’s last two albums, “Double Fantasy” and the posthumously released “Broken Glass”; both records featured some material the former Beatle had either written or polished in Bermuda in 1980. 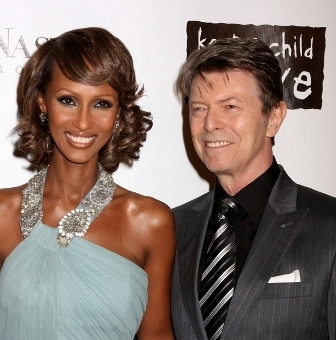 Mr. Bowie and Iman had re-located to London by 2007. The UK exhibit charts the career of the musical chameleon, who was born David Jones in London in 1947 and went on to create outlandish personas including alien rock star Ziggy Stardust in the 1970s. Throughout his career, he has sold an estimated 140 million albums and in 2004 “Rolling Stone” magazine ranked him 39th on their list of the “100 Greatest Artists of All Time”, and 23rd on their list of the best singers of all time. He has the Number one song on the British charts right now.